2017-18 ARTBA Chairman Matt Cummings of AECOM & WTS International Chairwoman Maggie Walsh of HDR sign the MOU in New York City. ARTBA and the Women’s Transportation Seminar International (WTS) have formed an alliance to support and advance women in the transportation infrastructure sector. 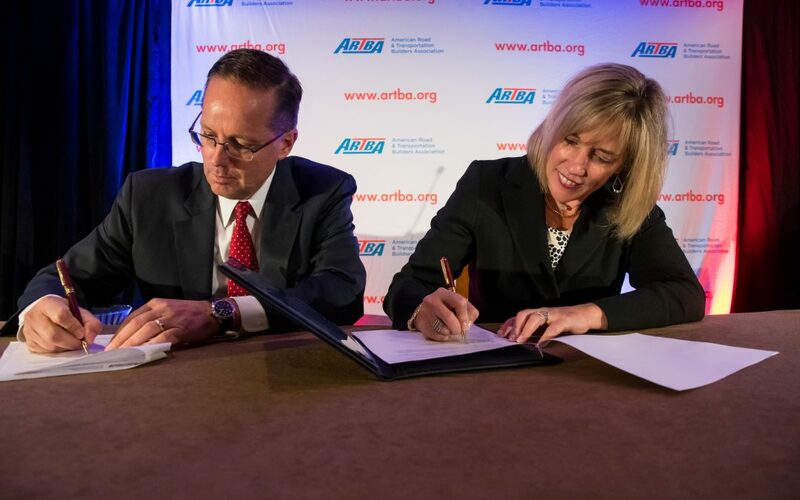 The organizations signed a memorandum of understanding (MOU) in early October at ARTBA’s National Convention in New York City. WTS is an international organization with more than 6,500 members in 79 chapters working to help advance women’s careers in transportation through professional development, encouragement and recognition. ARTBA & WTS will support each other in the development of content for meetings and conferences, including identifying speakers, opportunities for jointly sponsored workshops, webinars and meetings, publicizing each other’s events, and supporting mentoring programs.